All pass line alignments are performed by utilizing computerized animated laser technology. 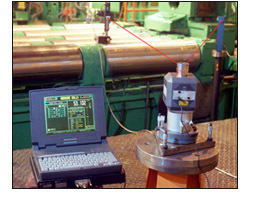 Fluid systems are tested, adjusted and monitored by the newest technology in electronic sensoring devices. Bearing coolant components are tested by automated flow control equipment for coolant capacity and reliability. Many technicians along with our managements staff have been thoroughly trained by OEM Alignment Specialists. Caster Maintenance is setting the standard by utilizing the most advanced laser alignment technology. By employing the "SMART" system, we've become the leaders in the Bearing Maintenance Industry.